Fans have been anxiously awaiting the release of teen/family movie To The Beat! since the trailer was first released in July. The movie releases across multiple platforms on March 13, and it is worth the wait. The script is lighthearted, with relevant lessons about family, friends and following your dreams. First-time director Jillian Clare deserves kudos for bringing a movie to life that delivers something for everyone - dance, drama and fun! 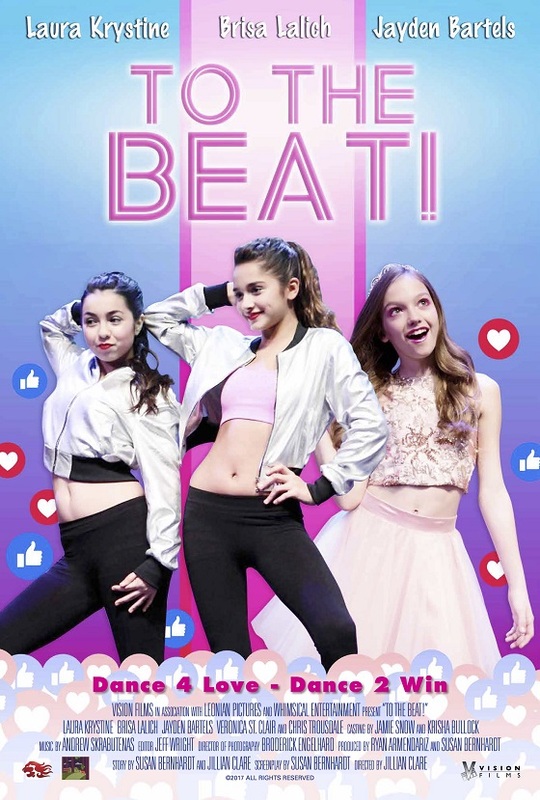 In To The Beat!, fourteen-year-old twins Mackie (Laura Krystine, Instructions Not Included) and Mia Castillo (Brisa Lalich) have been dancing since they were toddlers. They support each other's passion through competitions and rehearsals, even though they prefer different styles: Mia loves tap and Mackie loves jazz. When their favorite pop star (Chris Trousdale) launches an online contest to find the most unique dancers for his new music video, the twins each form their own team to compete. With the help of their family and friends, Pauly (Jaheem Toombs, 100 Things To Do Before High School) and Doug (Trevor Larcom, Fuller House), they campaign for the most votes on social media. Meanwhile, their arch-rival and neighbor Avery, (Jayden Bartels, Dance Moms, Musical.ly Star), uses her charm and resources to gain the upper hand in the competition. In addition to being directed by Clare, who once played Abigail on Days of our Lives, the cast includes a number of other familiar faces to soap opera fans. We Love Soaps asked these current and former soap stars to share their thoughts on To The Beat! Check out our exclusive interview below. tapping in the background, plays Mia Castillo. Photo courtesy of Leonian Pictures. WE LOVE SOAPS: What was your favorite scene in the film? ERIC MARTSOLF: Having never had a daughter in real life, I truly enjoyed the one on one “parental discussion” with Jayden. It was an interesting glimpse into what fatherhood with a girl would have been! MARTHA MADISON: I love the scene where you get to meet Michael and Clare for the first time. Eric is pitch perfect and getting to sing Paula Abdul songs loud (and very badly) was so fun. I laughed all day that day! LILLY MELGAR: It has to be my kitchen scene with the girls. We had so much fun it's ridiculous! Jillian gave me a direction and I took the note and committed to it 100% and it was oh... sooo.... "too much"... that I completely startled the actress (Veronica St. Claire). It was the most amazing moment. I'm literally laughing out loud right now as I type. MARIE WILSON: I loved watching the teens' characters interacting with each other....too many funny scenes between them.....and of course, the dance choreography was so well done! JILLIAN CLARE: My favorite scene was probably the stand off between the two teams in the twins driveway. I loved watching all the girls fire back at each other. They’re all so talented and it was fun seeing these future stars all work together to create a fun scene. WE LOVE SOAPS: Have you ever been in a "teen movie" before? ERIC MARTSOLF: This would mark my first. MARTHA MADISON: Nope. This is definitely a first, and I hope it won't be the last. It's so exciting to work with young, talented actors and actresses. This group of kids are incredible so it was a daily dose of inspiration for us old folks. 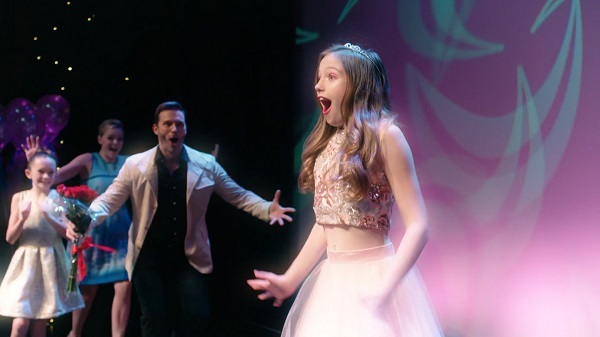 (left to right): Avery Hewitt, Martha Madison and Eric Martsolf. LILLY MELGAR: No! I have not! I'm a child stuck in an adult's body so it was my very own personal Disneyland shoot. Again, ridiculous fun! When we weren't on camera shooting the film, we were shooting our own videos behind the scenes. Jaheem Toombs taught me the 'correct' way to do the Beyonce strut. LOL ... Can we please go back and do it all over again? WE LOVE SOAPS: Have you ever danced on camera before? ERIC MARTSOLF: I dance around probably more than I casually walk in real life. I spent three years on the Joseph tour in a Pharaoh costume wiggling in front of thousands. MARTHA MADISON: I have a really extensive dance background including decades of formal training and teaching, but I don't think I've ever done it on camera. I might be scared to do it at this stage in my life, but I'd always be open to trying! Can't promise success though! Ha! siblings on the small screen and a couple in To The Beat! WE LOVE SOAPS: You've worked with Jillian Clare as an actor, but how was it working with her as your director? ERIC MARTSOLF: She's just begun her directorial journey, and if her handling of future projects reflects this one, she will have stellar projects on the horizon. MARTHA MADISON: Jillian is a natural! This business so clearly runs through her veins. It's ingrained in her DNA. I've always been so impressed with Jillian's deep knowledge of the industry, her grit, her fearlessness and her ability to communicate so clearly with any type of person. These are the traits that separate the talkers from the do-ers. She's going to have a very bright future! LILLY MELGAR: Jillian's level of calm under extraordinary circumstances is awe inspiring! Truly a talent to be respected and admired. Her laser focus and calm inspired trust and set the foundation for a positive set experience. I am so proud of her and look forward to working with her again. MARIE WILSON: I was so impressed that she took on such a project for her directorial debut since a dance film has so many challenges, but she did it with grace, ease and focus. I couldn't have done that at her age! WE LOVE SOAPS: Martha and Eric, you play half siblings on Days of our Lives, and now you're playing husband and wife? How was that transition? ERIC MARTSOLF: Completely awkward and I enjoyed every second! MARTHA MADISON: Luckily, it's all G-rated! Ha! I do think we have great chemistry no matter what relation we are playing. I consider Eric a great friend and a terrific actor. I'd feel lucky to work with him any day, anywhere, under any circumstances. in To The Beat! Photo courtesy of Leonian Pictures. WE LOVE SOAPS: Lilly and Marie, you played partners in crime on the Amazon series Ladies of the Lake, how was it being part of the same family in To The Beat!? LILLY MELGAR: Working with Marie Wilson is seamless. Having that kind of connection with another actor is half the work. I get to just show up and be present and live it. ANYTHING with Marie Wilson .. ANY TIME ... ANY DAY. MARIE WILSON: Having worked with Lilly before made it ideal to be playing family members.....it was just so easy and authentic.....I love Lilly!! WE LOVE SOAPS: Jillian, what was your biggest challenge as a first-time director? JILLIAN CLARE: I don't think I really encountered "challenges" per se. I always think of hiccups as a puzzle, and I love puzzles. I guess the most time-consuming and puzzling things to film were the dance scenes and the finale since there were so many dancers, actors, and background! Thankfully, my Director of Photography, Broderick Engelhard, and I had put in a ton of time thinking about the finale and shot-listing. We were able to get everything I had wanted and more! to direct To The Beat! Photo courtesy of Leonian Pictures. WE LOVE SOAPS: Did you ever think about acting in the movie too? JILLIAN CLARE: I never thought about being in the film as well. I think to really excel in a craft you need to have 100% focus on it. I know there are a lot of successful directors who also star in the films they are directing, but many have been solely a director before. When you start in a film and direct it, a lot of the take-to-take stuff falls onto the 1st AD and DP to tell you that they think it's good. It's very time consuming to watch every single take right after it's been filmed. I wanted to fully dive into and indulge in the responsibilities of the director this time. Maybe one day in the future, when I feel I have reached the level I want to be at, I'll be able to star and direct a film! WE LOVE SOAPS: What was it like to direct your co-stars from Acting Dead and Ladies of the Lake? JILLIAN CLARE: It was so fun! I love them all very much and it was cool to be able to creatively work with them in a different way. They're all such stellar actors to begin with, and we had a blast being together again! The story was created by Susan Bernhardt and Jillian Clare. The screenplay was written by Susan Bernhardt. The movie is produced by Ryan Armendariz, Susan Bernhardt and Jillian Clare. You don't have to wait until the movie releases across multiple platforms on March 13! 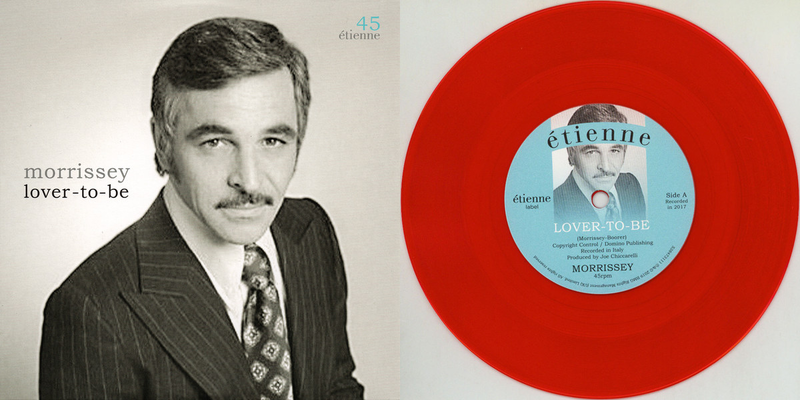 Pre-orders are now available on both iTunes and Amazon.